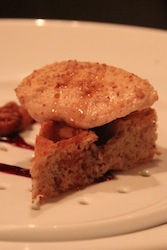 You thought our “special culinary weekend” was about the French Laundry, didn’t you? Well, it was, of course … in large part. 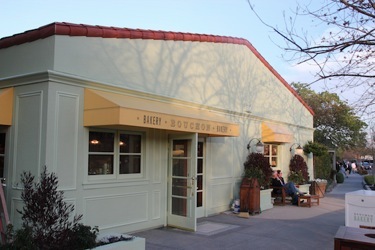 But as I said in the last post, our philosophy is “go big, or go home.” After we confirmed our reservations for the French Laundry – and who was coming up to Yountville, and when – Nick made Friday night dinner reservations for Bouchon, and Sunday Brunch reservations for Ad Hoc. I love my husband. We drove up to Yountville Friday afternoon (THANK YOU, Laurie! 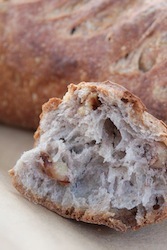 ), and headed over to Bouchon Bakery for a little treat to start our weekend. Laurie got a hot cross bun, as it was Good Friday (and it was always a tradition in her house growing up), we also got a loaf of walnut bread to share for the weekend, and Nick got a peanut butter cup the size of a hockey puck! 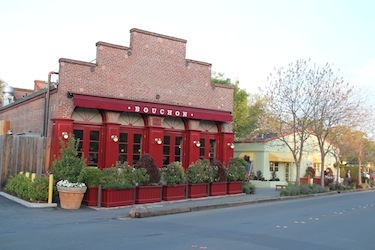 Later that night, we went to Bouchon for dinner. It was a wonderful way to really kick off the weekend. 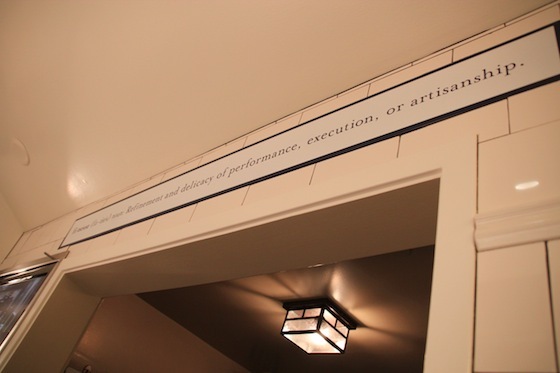 The food, the wine, the service … everything was superb. 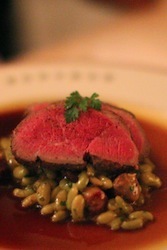 I had the “Gigot d’Angneau” – roasted leg of lamb with Merguez sausage, Flageolet beans, and thyme jus. 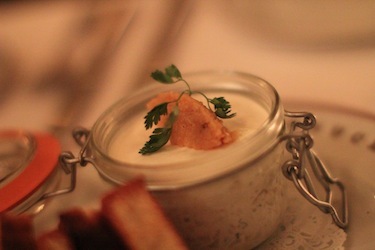 We all split an appetizer of Smoked Sturgeon Rillettes that blew our minds. 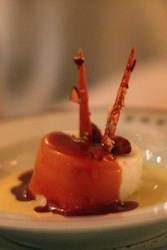 For dessert, we split a dish of Profiteroles, and the “Ile Flottante” – meringue with vanilla crème anglaise, almond and caramel. Heavenly. Saturday morning we primed our stomaches for culinary magic by sitting down to … some culinary magic. 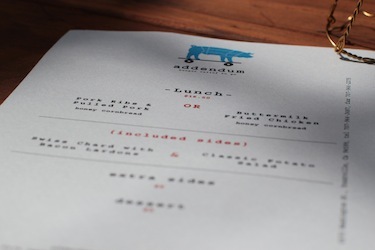 Addendum is the adorable “shack” addition to the Ad Hoc restaurant, serving boxed lunches to go on Thursdays through Saturdays. 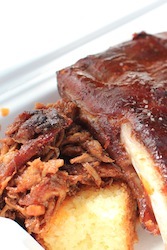 Here, there are two lunches on the menu: Fried Chicken or Barbecue. Do yourself a favor – if you go to Addendum, don’t be silly – get [at least] one of each. We did. You won’t regret it. 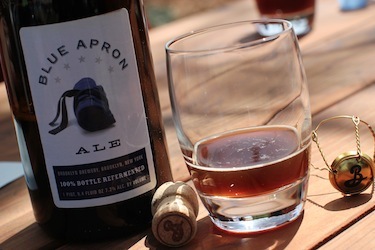 We also split a bottle of their special Blue Apron Ale, made just for them by Brooklyn Brewery. So good. And perfect for this meal. 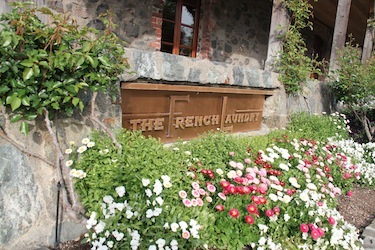 And of course, the main event, Saturday night we went to the famous French Laundry. An experience like no other. If you haven’t read the post, you can read about it here. We read over and over again about how the French Laundry simply ruined people, and that they were even full the next day, so we were a bit concerned as to whether or not we’d be in the mood for Ad Hoc on Sunday. But after our marathon event at the French Laundry, we were actually in good shape. 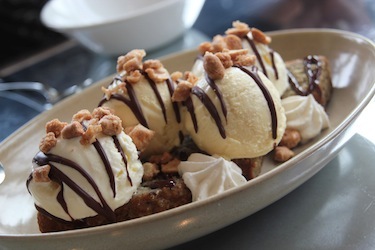 We paced our dinner well … which is why we ended up being there for seven hours. Sunday morning, we were raring to go! And Ad Hoc did NOT disappoint. 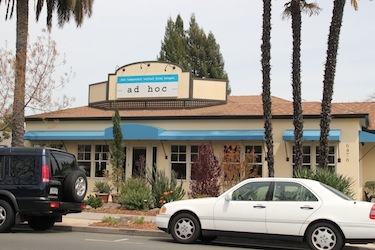 Ad Hoc has a prix fixe meal like the French Laundry, but it’s “only” three courses, and it’s family style. 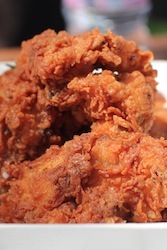 Even though we had enjoyed the fried chicken at Addendum on Saturday morning, we were super excited to see it here – and in this presentation? Happy Easter! Crispy, juicy, succulent fried chicken, sourdough waffles, and a nice slathering of house-made sausage gravy that was deliciously unlike any other sausage gravy we’d ever had. Add roasted asparagus, and it was Heaven. Just absolutely divine. 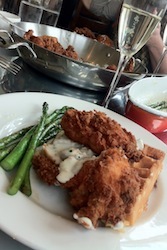 Best Chicken and Waffles I’ve ever had – and I’ve had some fantastic chicken and waffles (Little Skillet right here in San Francisco has some of the best, by the way). 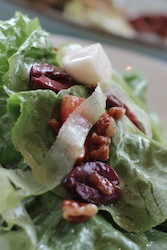 We also had a gorgeous baby mixed greens salad, with easter egg radishes, kalamata olives, pecans, bacon lardons and those pretty strips of shaved celery, and a wholesomely sinful banana bread sundae with crème fraiche and coconut ice creams, chocolate sauce, and candied peanuts for dessert. 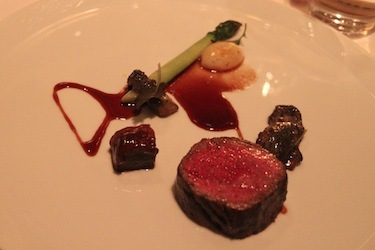 Our Thomas Keller weekend was nothing short of spectacular. 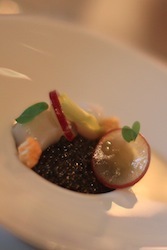 From the comfortable, casual picnic style of Addendum to the over-the-top luxury of The French Laundry, every magnificent morsel we had this weekend was of unequivocally stellar quality, design, and of course, taste. Yountville is beautiful, everything is carefully maintained and manicured, and we joked about it being more like “Keller-Land” – a fantastical place for grown-ups to go, and believe in magic. And unlike an amusement park, where all the rides are basically the same, every visit to any of these places (with the exception of Addendum, but it’s a wonderful exception) will yield a totally different taste sensation! As insane as this weekend has been (the quote up top does hilariously have truth to it), I simply cannot wait to go back, and relive the experience again.